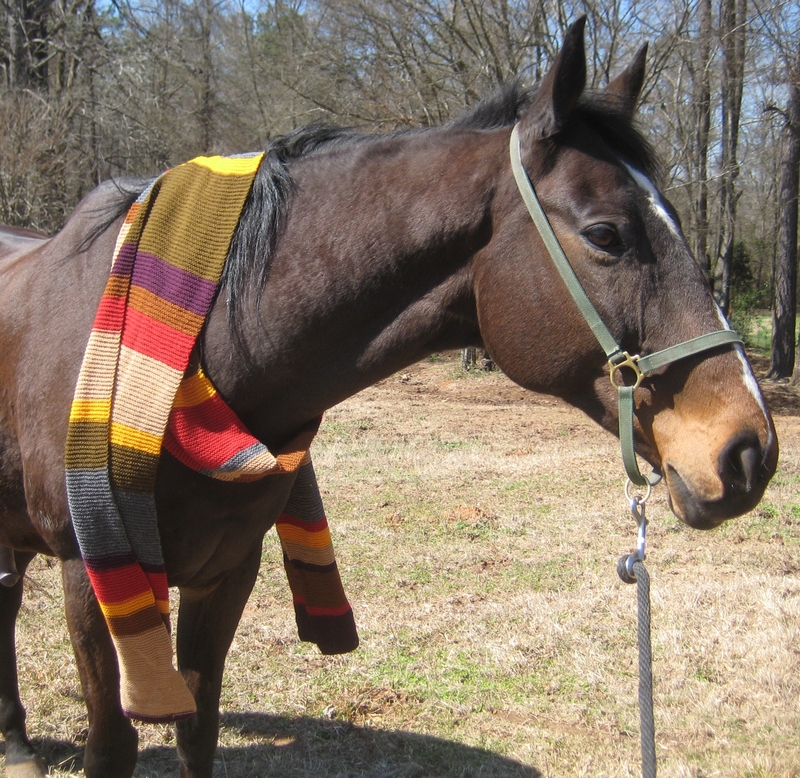 Rodney wearing a 411-centimeter, custom-knit, chromatically-accurate, Doctor Who scarf. Production details from the creator here. Note for photographers: My goal for Foto Friday is technical merit as much as content. The foreshortening is not ideal and Rodney’s coat color could be richer. This shot ended being all about photostyling: getting the scarf to drape, making sure it was in the light, getting Rodney’s ears up, having a decent expression on his face, keeping my ugly barn out of the background, and so on. Brohoof to his kin in Ponyville. Update: Questions concerning this post posed here. That is fabulous! Rodney looks very debonair. Just, if you decided to wash the scarf, COLD water, let dry flat. Otherwise, it will felt. I cannot stress enough that this wool does not like to be wet and agitated. Catlike, you might say. As a fellow horse photographer…the perky ears is a challenge in and of itself, if no one else is there to do circus tricks. Well played! Cute shot, love the horse…so pretty! I’ve been a Doctor Who fan since the 1970s and have an accurate copy of another version of the scarf, purchased from a knitter who used BBC directions. The colors go very nicely on him. He is quite dashing. He looks great and your patience really paid off.